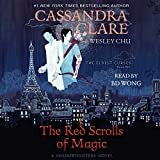 From number one New York Times best seller Cassandra Clare and award-winner Wesley Chu comes the first audiobook in a new series that follows High Warlock Magnus Bane and Alec Lightwood as they tour the world after the Mortal War. The Red Scrolls of Magic is a Shadowhunters novel. All Magnus Bane wanted was a vacation - a lavish trip across Europe with Alec Lightwood, the shadowhunter who against all odds is finally his boyfriend. But as soon as the pair settles in Paris, an old friend arrives with news about a demon-worshiping cult called the Crimson Hand that is bent on causing chaos around the world. A cult that was apparently founded by Magnus himself. Years ago. As a joke. Now, Magnus and Alec must race across Europe to track down the Crimson Hand and its elusive new leader before the cult can cause any more damage. As if it wasn't bad enough that their romantic getaway has been sidetracked, demons are now dogging their every step, and it is becoming harder to tell friend from foe. As their quest for answers becomes increasingly dire, Magnus and Alec will have to trust each other more than ever - even if it means revealing the secrets they've both been keeping. Don't miss The Mortal Instruments: City of Bones, now a major motion picture. Discover this first installment of the internationally best-selling Mortal Instruments series and "prepare to be hooked" (Entertainment Weekly). When 15-year-old Clary Fray heads out to the Pandemonium Club in New York City, she hardly expects to witness a murder - much less a murder committed by three teenagers covered with strange tattoos and brandishing bizarre weapons. Then the body disappears into thin air. It's hard to call the police when the murderers are invisible to everyone else and when there is nothing - not even a smear of blood - to show that a boy has died. Or was he a boy? This is Clary's first meeting with the Shadowhunters, warriors dedicated to ridding the earth of demons. It's also her first encounter with Jace, a Shadowhunter who looks a little like an angel and acts a lot like a jerk. 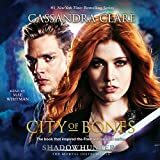 Within twenty-four hours Clary is pulled into Jace's world with a vengeance, when her mother disappears and Clary herself is attacked by a demon. But why would demons be interested in ordinary mundanes like Clary and her mother? And how did Clary suddenly get the Sight? The Shadowhunters would like to know... Exotic and gritty, exhilarating and utterly gripping, Cassandra Clare's ferociously entertaining fantasy takes readers on a wild ride that they will never want to end. Dark secrets and forbidden love threaten the very survival of the Shadowhunters in Cassandra Clare's Queen of Air and Darkness, the final novel in the number-one New York Times and USA Today best-selling the Dark Artifices trilogy. Queen of Air and Darkness is a Shadowhunters novel. What if damnation is the price of true love? Innocent blood has been spilled on the steps of the Council Hall, the sacred stronghold of the Shadowhunters. In the wake of the tragic death of Livia Blackthorn, the Clave teeters on the brink of civil war. One fragment of the Blackthorn family flees to Los Angeles, seeking to discover the source of the disease that is destroying the race of warlocks. Meanwhile, Julian and Emma take desperate measures to put their forbidden love aside and undertake a perilous mission to Faerie to retrieve the Black Volume of the Dead. What they find in the Courts is a secret that may tear the Shadow World asunder and open a dark path into a future they could never have imagined. Caught in a race against time, Emma and Julian must save the world of Shadowhunters before the deadly power of the parabatai curse destroys them and everyone they love. By number-one New York Times best-selling author Holly Black, the first book in a stunning new series about a mortal girl who finds herself caught in a web of royal faerie intrigue. Of course I want to be like them. They're beautiful as blades forged in some divine fire. They will live forever. And Cardan is even more beautiful than the rest. I hate him more than all the others. I hate him so much that sometimes when I look at him, I can hardly breathe. Jude was seven years old when her parents were murdered and she and her two sisters were stolen away to live in the treacherous High Court of Faerie. Ten years later, Jude wants nothing more than to belong there, despite her mortality. But many of the fey despise humans. Especially Prince Cardan, the youngest and wickedest son of the High King. To win a place at the Court, she must defy him - and face the consequences. In doing so, she becomes embroiled in palace intrigues and deceptions, discovering her own capacity for bloodshed. But as civil war threatens to drown the Courts of Faerie in violence, Jude will need to risk her life in a dangerous alliance to save her sisters, and Faerie itself. A girl who can speak to gods must save her people without destroying herself. A prince in danger must decide who to trust. A boy with a monstrous secret waits in the wings. Together, they must assassinate the king and stop the war. In a centuries-long war where beauty and brutality meet, their three paths entwine in a shadowy world of spilled blood and mysterious saints, where a forbidden romance threatens to tip the scales between dark and light. Wicked Saints is the thrilling start to Emily A. Duncan's devastatingly Gothic Something Dark and Holy trilogy. An instant New York Times bestseller! "Prepare for a snow-frosted, blood-drenched fairy tale where the monsters steal your heart and love ends up being the nightmare." - Roshani Chokshi, New York Times bestselling author of The Gilded Wolves and The Star-Touched QueenA girl who can speak to gods must save her people without destroying herself.A prince in danger must decide who to trust.A boy with a monstrous secret waits in the wings. Together, they must assassinate the king and stop the war.In a centuries-long war where beauty and brutality meet, their three paths entwine in a shadowy world of spilled blood and mysterious saints, where a forbidden romance threatens to tip the scales between dark and light. Wicked Saints is the thrilling start to Emily A. Duncan's devastatingly Gothic Something Dark and Holy trilogy. "This book destroyed me and I adored it. "- Stephanie Garber, New York Times bestselling author of CaravalThis edition uses deckle edges; the uneven paper edge is intentional. The New York Times best-selling Mortal Instruments continues - and so do the thrills and danger for Jace, Clary, and Simon. Can the lost be reclaimed? What price is too high to pay for love? Who can be trusted when sin and salvation collide? Darkness threatens to claim the Shadowhunters in the harrowing fifth book of the Mortal Instruments series. Everything I know is a lie.I'm an ordinary mortal girl. Lord Irrik is a depraved dragon shifter. King Irdelron is an immortal tyrant.In the disease ridden land of Verald, life is mapped out much like the established rings of our kingdom. Everyone has a role...Me? I'll be uselessly serving potato stew for the rest of my life because I can't make anything grow.But starvation brews rebellion.When the king strikes, I'm captured by Lord Irrik. Instantly, I'm embroiled in a deadly game. One where I'm desperate to understand the rules.Because nothing makes sense anymore.Now, I'm not only fighting for my life . . . but a love that could be the key to my freedom.What if the truth means you're not who -- or what -- you thought you were?Fans of dark fantasy, dragons, intrigue, and romance will devour this story. Scroll up and one-click now!Due to thematic elements, this series is recommended for mature YA and up. From #1 New York Times bestseller Cassandra Clare and award-winner Wesley Chu comes the first book in a new series that follows High Warlock Magnus Bane and Alec Lightwood as they tour the world after the Mortal War. 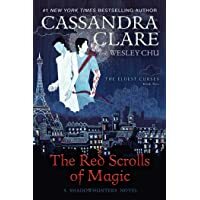 The Red Scrolls of Magic is a Shadowhunters novel.All Magnus Bane wanted was a vacation--a lavish trip across Europe with Alec Lightwood, the Shadowhunter who against all odds is finally his boyfriend. But as soon as the pair settles in Paris, an old friend arrives with news about a demon-worshipping cult called the Crimson Hand that is bent on causing chaos around the world. A cult that was apparently founded by Magnus himself. Years ago. As a joke. Now Magnus and Alec must race across Europe to track down the Crimson Hand and its elusive new leader before the cult can cause any more damage. As if it wasn't bad enough that their romantic getaway has been sidetracked, demons are now dogging their every step, and it is becoming harder to tell friend from foe. As their quest for answers becomes increasingly dire, Magnus and Alec will have to trust each other more than ever--even if it means revealing the secrets they've both been keeping. An instant bestseller!By #1 New York Times bestselling author Holly Black, the first book in a stunning new series about a mortal girl who finds herself caught in a web of royal faerie intrigue. Of course I want to be like them. They're beautiful as blades forged in some divine fire. They will live forever.And Cardan is even more beautiful than the rest. I hate him more than all the others. I hate him so much that sometimes when I look at him, I can hardly breathe.Jude was seven years old when her parents were murdered and she and her two sisters were stolen away to live in the treacherous High Court of Faerie. Ten years later, Jude wants nothing more than to belong there, despite her mortality. But many of the fey despise humans. 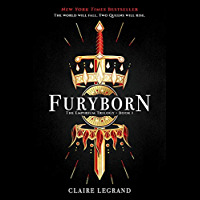 Especially Prince Cardan, the youngest and wickedest son of the High King.To win a place at the Court, she must defy him--and face the consequences.In doing so, she becomes embroiled in palace intrigues and deceptions, discovering her own capacity for bloodshed. But as civil war threatens to drown the Courts of Faerie in violence, Jude will need to risk her life in a dangerous alliance to save her sisters, and Faerie itself. All first editions will include exclusive reverse-printed jacket art, ten black and white interior illustrations, and a new short story! Dark secrets and forbidden love threaten the very survival of the Shadowhunters in Cassandra Clare's Queen of Air and Darkness, the final novel in the #1 New York Times and USA TODAY bestselling The Dark Artifices trilogy. Queen of Air and Darkness is a Shadowhunters novel.What if damnation is the price of true love? Innocent blood has been spilled on the steps of the Council Hall, the sacred stronghold of the Shadowhunters. In the wake of the tragic death of Livia Blackthorn, the Clave teeters on the brink of civil war. One fragment of the Blackthorn family flees to Los Angeles, seeking to discover the source of the disease that is destroying the race of warlocks. Meanwhile, Julian and Emma take desperate measures to put their forbidden love aside and undertake a perilous mission to Faerie to retrieve the Black Volume of the Dead. What they find in the Courts is a secret that may tear the Shadow World asunder and open a dark path into a future they could never have imagined. Caught in a race against time, Emma and Julian must save the world of Shadowhunters before the deadly power of the parabatai curse destroys them and everyone they love. All first editions will include ten black and white interior illustrations and a new short story! Dark secrets and forbidden love threaten the very survival of the Shadowhunters in Cassandra Clare's Queen of Air and Darkness, the final novel in the #1 New York Times and USA TODAY bestselling The Dark Artifices trilogy. Queen of Air and Darkness is a Shadowhunters novel.What if damnation is the price of true love? Innocent blood has been spilled on the steps of the Council Hall, the sacred stronghold of the Shadowhunters. In the wake of the tragic death of Livia Blackthorn, the Clave teeters on the brink of civil war. One fragment of the Blackthorn family flees to Los Angeles, seeking to discover the source of the disease that is destroying the race of warlocks. Meanwhile, Julian and Emma take desperate measures to put their forbidden love aside and undertake a perilous mission to Faerie to retrieve the Black Volume of the Dead. What they find in the Courts is a secret that may tear the Shadow World asunder and open a dark path into a future they could never have imagined. Caught in a race against time, Emma and Julian must save the world of Shadowhunters before the deadly power of the parabatai curse destroys them and everyone they love. All six books in the #1 New York Times bestselling Mortal Instruments series, now available in a collectible paperback boxed set.Enter the secret world of the Shadowhunters with this handsomely packaged boxed set that includes City of Bones, City of Ashes, City of Glass, City of Fallen Angels, City of Lost Souls, and City of Heavenly Fire. The Mortal Instruments books have more than twenty-four million copies in print, and this complete collectible set of six paperback volumes is a perfect gift for newcomers to the series and for loyal fans alike. Discover this first installment of the internationally bestselling Mortal Instruments series and "prepare to be hooked" (Entertainment Weekly).When fifteen-year-old Clary Fray heads out to the Pandemonium Club in New York City, she hardly expects to witness a murder -- much less a murder committed by three teenagers covered with strange tattoos and brandishing bizarre weapons. Then the body disappears into thin air. It's hard to call the police when the murderers are invisible to everyone else and when there is nothing -- not even a smear of blood -- to show that a boy has died. Or was he a boy?This is Clary's first meeting with the Shadowhunters, warriors dedicated to ridding the earth of demons. It's also her first encounter with Jace, a Shadowhunter who looks a little like an angel and acts a lot like a jerk. Within twenty-four hours Clary is pulled into Jace's world with a vengeance, when her mother disappears and Clary herself is attacked by a demon. But why would demons be interested in ordinary mundanes like Clary and her mother? And how did Clary suddenly get the Sight? The Shadowhunters would like to know... Exotic and gritty, exhilarating and utterly gripping, Cassandra Clare's ferociously entertaining fantasy takes readers on a wild ride that they will never want to end. #1 New York Times Bestseller * An Amazon Best Book of the YearThere's no such thing as safe in a city at war, a city overrun with monsters. In this dark urban fantasy from acclaimed author Victoria Schwab, a young woman and a young man must choose whether to become heroes or villains--and friends or enemies--with the future of their home at stake. The first of two books, This Savage Song is a must-have for fans of Holly Black, Maggie Stiefvater, and Laini Taylor.Kate Harker and August Flynn are the heirs to a divided city--a city where the violence has begun to breed actual monsters. All Kate wants is to be as ruthless as her father, who lets the monsters roam free and makes the humans pay for his protection. All August wants is to be human, as good-hearted as his own father, to play a bigger role in protecting the innocent--but he's one of the monsters. One who can steal a soul with a simple strain of music. When the chance arises to keep an eye on Kate, who's just been kicked out of her sixth boarding school and returned home, August jumps at it. But Kate discovers August's secret, and after a failed assassination attempt the pair must flee for their lives. In This Savage Song, Victoria Schwab creates a gritty, seething metropolis, one worthy of being compared to Gotham and to the four versions of London in her critically acclaimed fantasy for adults, A Darker Shade of Magic. Her heroes will face monsters intent on destroying them from every side--including the monsters within. The #1 New York Times and USA TODAY bestseller is now available at an incredible low price for a limited time only! The Shadowhunters of Los Angeles star in the first novel in Cassandra Clare's newest series, The Dark Artifices, a sequel to the internationally bestselling Mortal Instruments series. Lady Midnight is a Shadowhunters novel.It's been five years since the events of City of Heavenly Fire that brought the Shadowhunters to the brink of oblivion. Emma Carstairs is no longer a child in mourning, but a young woman bent on discovering what killed her parents and avenging her losses. Together with her parabatai Julian Blackthorn, Emma must learn to trust her head and her heart as she investigates a demonic plot that stretches across Los Angeles, from the Sunset Strip to the enchanted sea that pounds the beaches of Santa Monica. If only her heart didn't lead her in treacherous directions... Making things even more complicated, Julian's brother Mark--who was captured by the faeries five years ago--has been returned as a bargaining chip. The faeries are desperate to find out who is murdering their kind--and they need the Shadowhunters' help to do it. But time works differently in faerie, so Mark has barely aged and doesn't recognize his family. Can he ever truly return to them? Will the faeries really allow it? Glitz, glamours, and Shadowhunters abound in this heartrending opening to Cassandra Clare's Dark Artifices series. Is love worth betraying everything? Plunge into the second adventure in the internationally bestselling Mortal Instruments series and "prepare to be hooked" (Entertainment Weekly).Clary Fray just wishes that her life would go back to normal. But what's normal when you're a demon-slaying Shadowhunter, your mother is in a magically induced coma, and you can suddenly see Downworlders like werewolves, vampires, and faeries? If Clary left the world of the Shadowhunters behind, it would mean more time with her best friend, Simon, who's becoming more than a friend. But the Shadowhunting world isn't ready to let her go -- especially her handsome, infuriating, newfound brother, Jace. And Clary's only chance to help her mother is to track down rogue Shadowhunter Valentine, who is probably insane, certainly evil--and also her father. To complicate matters, someone in New York City is murdering Downworlder children. Is Valentine behind the killings--and if he is, what is he trying to do? When the second of the Mortal Instruments, the Soul-Sword, is stolen, the terrifying Inquisitor arrives to investigate and zooms right in on Jace. How can Clary stop Valentine if Jace is willing to betray everything he believes in to help their father? In this breathtaking sequel to City of Bones, Cassandra Clare lures her readers back into the dark grip of New York City's Downworld, where love is never safe and power becomes the deadliest temptation. A #1 New York Times and USA TODAY bestseller Sunny Los Angeles can be a dark place indeed in Cassandra Clare's Lord of Shadows, the bestselling sequel to Lady Midnight. 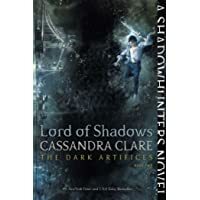 Lord of Shadows is a Shadowhunters novel.Emma Carstairs has just learned that the love she shares with her warrior partner and parabatai, Julian Blackthorn, isn't just forbidden--it could destroy them both. She knows she should run from Julian. But how can she when the Blackthorn family is threatened by enemies on all sides? Their only hope is the Black Volume of the Dead, a spell book of terrible power. Everyone wants it. Only the Blackthorns can find it. Spurred on by a dark bargain with the Seelie Queen, Emma; her best friend, Cristina; and Mark and Julian Blackthorn embark on a journey into the Courts of Faerie, where glittering revels hide bloody danger and no promise can be trusted. As dangers close in, Julian devises a risky new scheme that depends on the cooperation of an unpredictable enemy. But success may come with a price he and Emma cannot even imagine, one that will have repercussions for everyone and everything they hold dear. From #1 New York Times and USA TODAY bestselling author Cassandra Clare comes the first novel in a brand-new trilogy where evil hides in plain sight and the only thing more dangerous than fighting demons is falling in love. 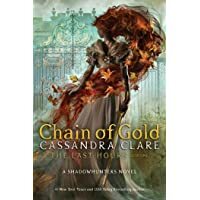 Chain of Gold is a Shadowhunters novel.Cordelia Carstairs is a Shadowhunter, a warrior trained since childhood to battle demons. When her father is accused of a terrible crime, she and her brother travel to Edwardian London in hopes of preventing the family's ruin. Cordelia's mother wants to marry her off, but Cordelia is determined to be a hero rather than a bride. Soon Cordelia encounters childhood friends James and Lucie Herondale and is drawn into their world of glittering ballrooms, secret assignations, and supernatural salons, where vampires and warlocks mingle with mermaids and magicians. All the while, she must hide her secret love for James, who is sworn to marry someone else. But Cordelia's new life is blown apart when a shocking series of demon attacks devastate London. These monsters are nothing like those Shadowhunters have fought before--these demons walk in daylight, strike down the unwary with incurable poison, and seem impossible to kill. London is immediately quarantined. Trapped in the city, Cordelia and her friends discover that their own connection to an dark legacy has gifted them with incredible powers--and force a brutal choice that will reveal the true cruel price of being a hero.